For this inaugural Discover Challenge: Blogging the Senses, Cheri asks us publish a post that piques one of the five senses, hearing, sight, touch, smell, and taste, having found inspiration herself in an interview with medieval book historian Erik Kwakkel. Since we are free to “interpret this in any way, and in any format: prose, poetry, photography, audio, video,” and having been also inspired by Erik Kwakkel’s blog myself thanks to Cheri’s introduction, I thought how appropriate this would be to revisit the Abbey of St. Antimo, a former Benedictine Monastry in the commune of Montalcino in Tuscany, which I blogged about over two years ago. 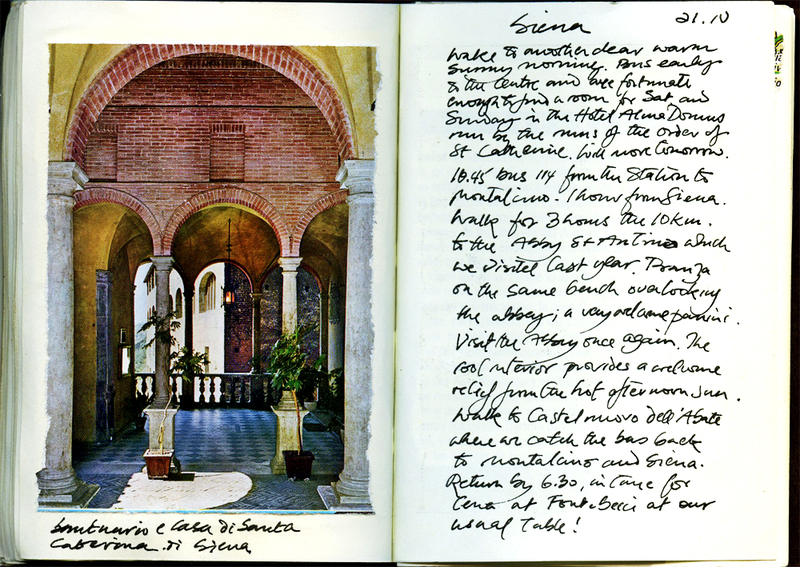 The map is from a journal I kept during our Italian travels in 2000, and the entry for the 21st of April describes our visit to the Abbey that day. 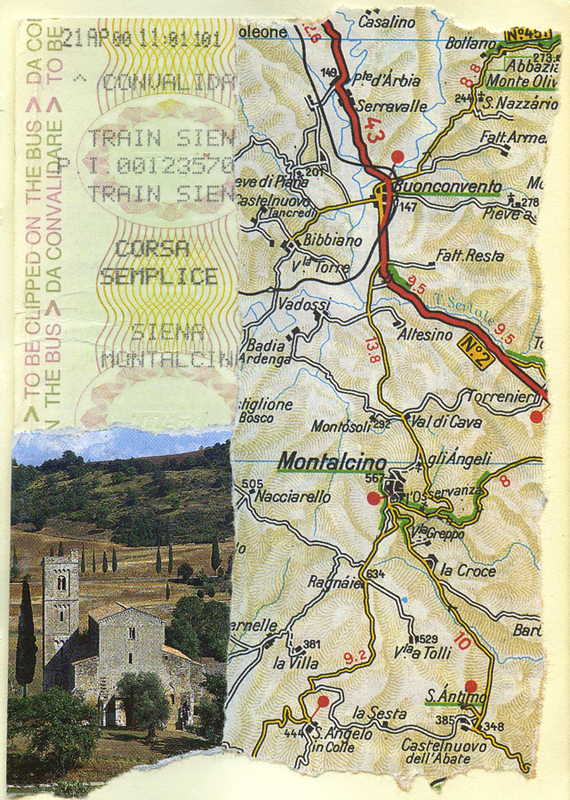 As you can read we took the bus from Siena to Montalcino and then walked the 10 kilometres to St. Antimo. The video is from the photographs I took during that memorable 10 kilometre walk through the magnificent Tuscan countryside. I hope your senses will be piqued as you enjoy the beauty of those Tuscan hills and listen to the Gregorian chant, “Haec Dies” from “Mysterium” a recording made in the Abbey in April 1995 by the five fathers of the Communita die Canonici Regolari di Sant’Antimo. Thank you for an idea, it looks like home but haven’t been yet. Although 10 km… well done! What a lovely idea this ‘blogging the senses’ is … I have bookmarked it for further thought. Your take is just wonderful … I find myself carried straight to Tuscany by the beauty of the images and the yearning voices reaching heavenwards. I can feel the earth, smell the air, taste the wild herbs and honey. And it pleases me!